Justin Leppitsch seems like a nice enough sort of a guy. It feels bad to point out after a person is sacked that they do not appear to have done a good job. 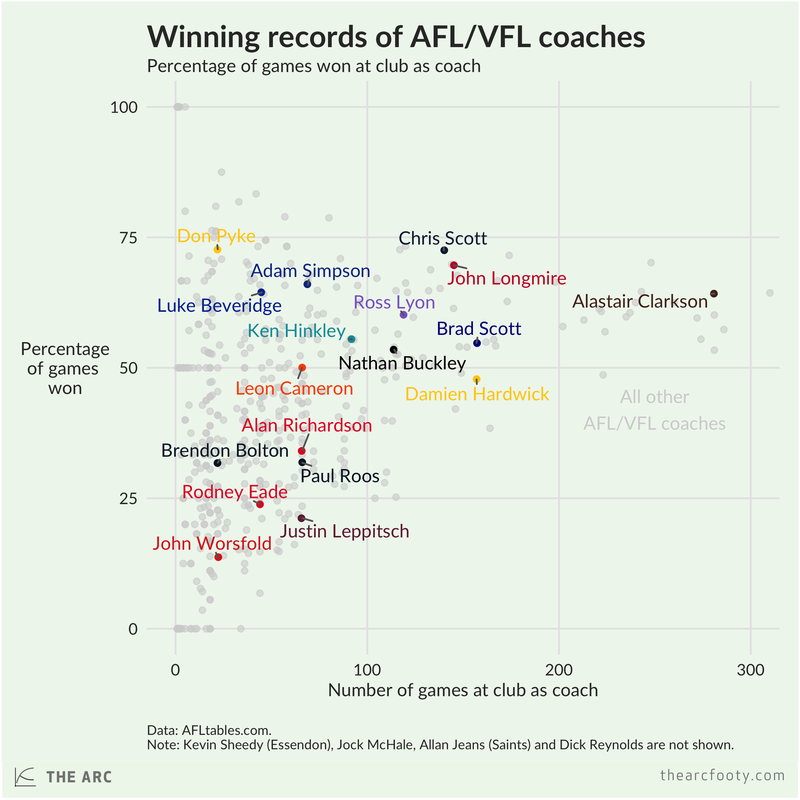 Nevertheless, it must be said: the Brisbane Lions under Leppitsch won a woefully small number of games, just 21.2% of their total, leaving him with one of the worst coaching records in AFL/VFL history. Here’s the record of every coach since 1897 in their stints at each club – coaches who’ve been at multiple clubs are on the graph multiple times, once for each club. The points show either their latest game (for currently-active coaches) or their final game at the club. You can see that there are very few coaches who’ve coached more than 50 games and won a lower percentage of games than Leppitsch. 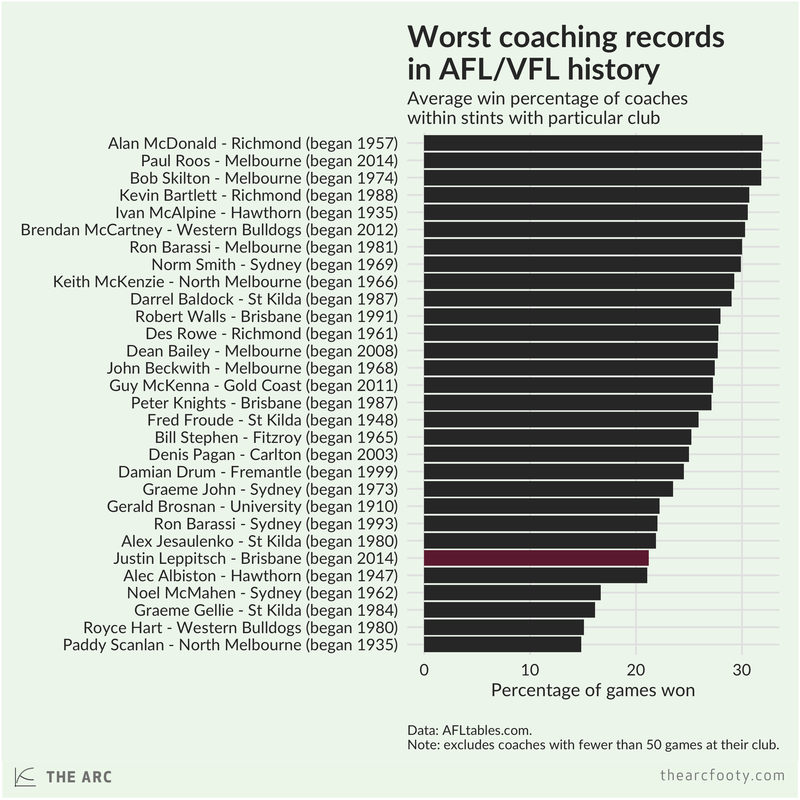 Among coaches who coached more than 50 games at their club, Leppitsch leaves the Lions with the sixth worst winning percentage. It’s the worst of any coach in the AFL era, beating out Ron Barassi’s record at Sydney and Damian Drum’s at the Dockers. Of course, it’s probably not fair to just compare coaches’ winning percentages. This doesn’t take into account the state of the club when they took over, or the club’s financial resources, or luck with injuries. But while winning isn’t everything when it comes to evaluating coaches, it’s not nothing either. With a record like Leppitsch’s, it’s not a surprise that he was shown the door.